This Norman Rockwell painting, entitled Uncle Sam Marching with Children, appeared on the cover of Red Cross on the April 1918 issue. 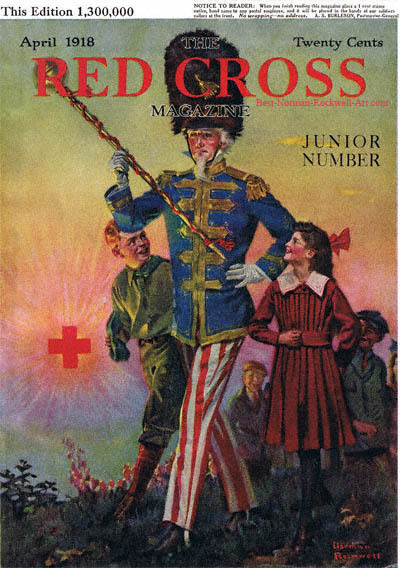 This was the first picture by Rockwell to appear on the Red Cross cover. Red Cross only published a total of four Rockwell illustrated covers, between 1918 and 1920. Uncle Sam Marching with Children was only one of many magazine covers that Rockwell painted. This cover is almost impossible to find without a mailing label. The mailing label is usually covering the sunburst and the red cross on the left side. Many times it also covers part of Uncle Sam as well. This cover appears on eBay fairly often, but not in the condition you see here. The painting itself is typical of Rockwell's work at this point in his career. Children were most often the subject in his early works. This painting shows a multitude of children jubilantly marching alongside and behind Uncle Sam. The line of children extends off the canvas to our right. The First World War was still in the full heat of battle at this time. Rockwell and Red Cross were using this painting to show support for America's role in the war. The children in this illustration are marching right in step with Uncle Sam. Sam is using his baton to mark time for the children in line behind him. The children have no trouble seeing him since he is much taller than they are. His bearskin hat extends a full 18 inches above his head. This issue also bears the Notice to Reader common on issues in 1918. The notice informs the reader what to do after she finishes reading this issue. All she needs to do is affix a one-cent stamp to the magazine. The Post Office will then deliver the magazine to soldiers and sailors serving America abroad.